When it comes to your kids, keeping them safe is your top priority. Here at Green Triangle, it’s our priority too. Our range of Children’s Hi Vis Vests are the perfect accompaniment to your childs first bike, or as part of their own little uniform when they’re helping Daddy out in the shed. Being tough and hard wearing, they're ideal for use in schools and early childhood education facilities too. 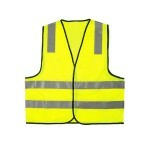 Whatever the situation, these hi vis vests are designed to stand out and be seen, with a huge range of fluro and hi vis colours, all designed to meet or exceed Australian Standards. And with our customisation service, you can add your childs name to their vest to make it extra special. 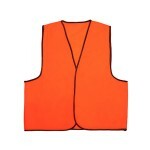 Manufactured in sizes for kids ages 2-16 years, our range of children's hi vis vests made to order in Australia, and with our super fast shipping, you can buy online and save! Children's Safety Vest Every kid loves to ride down the street on their bike, or help Mum and Dad to walk the family dog. Kids love to be outside, but with busy roads and crowded malls, it’s importa..
Reflective Children's Safety Vest Kids love exploring anywhere and everywhere. Sometimes it’s going to work with Mum or Dad, or helping out in the shed. Sometimes its as simple as riding their bike ..